Tsuyama is a city in the northern part of Okayama prefecture, and has produced many doctors and great minds since the Edo period (1603-1868),including the Udagawa and Mitsukuri families who were representative Japanese families of doctors. Tsuyama Chuo Hospital is a large general hospital that offers prevention, check-ups, emergency care, high-level treatment, and disaster medical care. It is also recognized by the government as a local cancer treatment core hospital. It has offered local medical care for many years as the local flagship hospital. 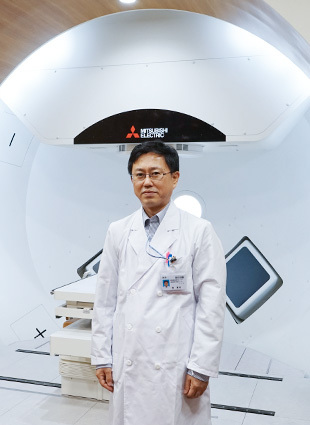 And as a result of specializing in cancer treatment, the hospital introduced new, high-quality, cutting-edge proton beam therapy equipment in April of 2016, and established the Center for Proton Beam Therapy for Cancer together with Okayama University. This Center received national advanced medical care certification in July of the same year. Currently, about 5,000 patients receive proton beam therapy in Japan. Most hospitals with proton beam therapy equipment are specialized hospitals, with a limited range of treatment options available. However, this Center is operated by Okayama University and Tsuyama Chuo Hospital, and has the advantage of being a part of a general hospital. If treatment is required, patients can hold conferences with doctors from other departments and disciplines, giving them the power to choose the most appropriate treatment method. For even greater results, proton beam therapy can be combined with chemotherapy, as well. To contribute to the global society, we have come up with strategies to develop from a local hospital to a global hospital to become a leading hospital in the future. We also established the International Medical Support Center to offer our services to non-Japanese patients. I have worked with cancer proton beam therapy for many years. I’ve participated in over 3,600 treatments. Each year, over 200 patients from abroad contact us about treatment. We will do our best to cooperate and improve, help patients recovery quickly, and help those patients return to a normal life. *Background music will play, so please be careful with the volume. What is the Center for Proton Beam Therapy, Jointly Operated by Okayama University and Tsuyama Chuo Hospital? As a base for cancer care in the Chugoku and Shikoku areas, The Center for Proton Beam Therapy, jointly operated by Okayama University and Tsuyama Chuo Hospital, supports patients’ quality of life and contributes to international medicine and the revitalization of the local area through improving medical care standards. Proton beam therapy stops is a type of radiation therapy that stops the growth of cancer (tumors, sarcoma, etc.) cells in the body through proton beam irradiation. This treatment allows cancer cells to be irradiated without damaging nearby organs, leading to effective treatment for cancers that are difficult to treat using x-ray or gamma ray radiation therapy. Having proton beam therapy as an option for cancer treatment will be very meaningful to those considering treatment in the future. A proton beam is a type of particle beam, and a particle beam is a stream of particles, such as neutrons, protons, carbon ions, and electrons. Both proton beams and carbon ion beams (heavy particle beams) are used in cancer treatment. We offer treatments using proton beams. Protons are the nucleus of particles, and they have a positive electric charge. Examples of diseases that can be effectively treated by proton beam therapy include aggregated tumors from prostate cancer, liver cancer, tumors at the base of the skull, head and neck tumors (paranasal sinus cancer, etc. ), and lung cancer. Proton beams have great penetrating power and can destroy cancer cells by accelerating the protons extracted from hydrogen atoms in a vacuum to nearly 70% the speed of light using a large device known as a Synchrotron. These proton beams are focused on cancerous cells, attacking and destroying them. The beam can be set to hit only the affected area by making use of a proton beam’s characteristics, leading to a reduction in side effects on non-affected areas compared to traditional wide-area radiation therapies. Proton beam therapy allows for irradiation at specific points based on the area and depth of the affected area, allowing only the cancerous areas deep in the body to be destroyed without damaging normal structures. This means that proton beam therapy is highly effective and protect important organs from damage. The patient can avoid invasive procedures, attacking the cancerous areas while minimizing side effects on surrounding healthy tissue. Depending on the patient’s strength, type of cancer, and combined treatments, patients may be able to enjoy a normal life while continuing cancer treatment. Most of the radiation from X-rays or gamma rays is absorbed by the skin, and only a small amount penetrated the body. With proton beams, however, only a small amount of energy is required to penetrate the surface of the skin, which means that the radiation can stop after the peak rapidly reaches a specific region deep in the body. This is known as the Bragg Peak, as the person who discovered it. For cancer therapy, the depth and width of this peak can be changed to suit the depth and size of the cancer (expanded Bragg peak). Proton beam therapy makes use of these characteristics. 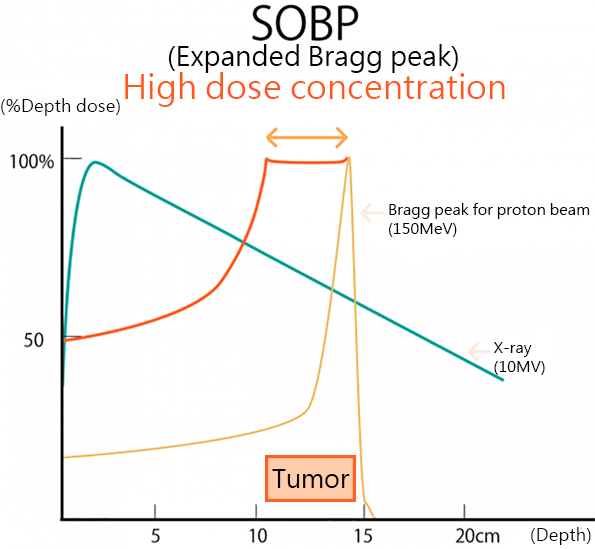 By controlling the Bragg peak and adjusting to the size and shape of the tumor, the beam can be stopped at the exact depth of the affected area, greatly minimizing the spread of irradiation. Pinpoint irradiation is possible without destroying any of the normal cells behind the cancer. More options are available for cancer treatment than before, allowing you to chose the best option for your needs. There is less risk of physical burden or side effects compared to surgery, chemotherapy, or traditional radiation therapies. Proton Beam can be safely administered to tumors near organs that are sensitive to the effects of radiation. Effective on tumors that do not respond well to x-ray treatments or are large (more than 6 cm). A normal lifestyle can be maintained while visiting the hospital for treatment, and a smooth rehabilitation can be expected after treatment. There is no pain or heat during therapy. In addition to retaining the form and functionality of your organs, no residual scars are left on the skin, allowing you to maintain your physical appearance and have peace of mind. This treatment is not suitable for stage 4 cancer that has spread throughout the body as it is a localized treatment. Treatment may be difficult for patients with lymph node metastasis. Even if the cancer has not metastasized, this treatment is best for early-stage cancer. This treatment is not suitable for stomach cancer and colon cancer caused by the digestive tract. Fees for advanced medical care are not covered by insurance, meaning the patient must bear the full cost of the treatment. Advanced medical care is performed at medical institutions that meet certain criteria for advanced medical technology, and is allowed to be performed alongside medical treatments that are covered by insurance. Application refers to cases where therapy offers the patient benefits. Diseases that are best suited for this therapy and confirmed to be effective include the aggregated tumors of prostate cancer, liver cancer, head and neck tumors (paranasal sinus cancer, etc. ), and lung cancer. The following diseases can be treated with proton beams, but based on location, age, and the stage of the disease and movement inside the body, the period when the treatment can be performed may be different for you. Please ask if you are eligible for proton beam therapy. Radiation dosage is gradually reduced as it is absorbed when entering the body in traditional x-ray radiation therapy, and areas around the cancerous area absorb some of this radiation, leading to side effects. Proton beam therapy effectively concentrates the radiation on the cancerous area only, leading to minimal side effects. Outpatient proton beam therapy is offered by recommendation from a doctor and by appointment only. Proton beam therapy is a type of radiation therapy, meaning it is not suitable for all types of cancer or all stages of cancer. Be sure to consult with your doctor carefully about this method of treatment. There are 3 main types of cancer treatment: surgical resection, chemotherapy, and radiation therapy. (Proton beam therapy is a type of radiation therapy.) Based on the characteristics of the disease and the disease’s progress, one or a combination of two or more therapies can be chosen for treatment. Multiple treatments can be performed at our hospital, together with the Chemotherapy Center and surgical resection. Proton beam therapy can be effective or difficult based on the location of the cancer. Currently, it is thought that proton beam therapy is best for primary cancers in the head and neck (nasal or paranasal, salivary gland, base of the skull, etc. ), lungs, kidneys, prostate, bladder, esophagus, and pancreas, in addition to reoccurring rectal cancer in the pelvic viscera after surgery and monostotic metastatic tumors (hepatic metastasis, lung metastasis, lymph node metastasis, etc.). Proton beam therapy is problematic for gastrointestinal cancers, such as in the stomach and large intestines, and cancer near the gastrointestinal tract as there is a risk of mucosal ulceration from the radiation. Effective results cannot be achieved by proton beam therapy if the cancer has spread to other organs or the lymph nodes, or if the size of the cancer is greater than 10 cm. Cancer that is greater than 10 cm is problematic due to the restrictions of the treatment equipment. We offer treatment primarily to prostate cancer, hepatoma, early stage lung cancer, advanced lung cancer, bile duct cancer, pancreatic carcinoma, and metastatic tumors, and offer treatment of esophageal cancer and reoccurring rectal cancer after treatment by appointment. We will list other diseases and when they can be treated on our website. ※When hospitalization, anti-cancer drug and other drug a treatment are necessary depending on condition of the patient, additional medical expenses will be occurred. If you have any questions about this part, please contact us. In general, we do initial acceptance screening and treatment payments through, Three international medical coordination companies that offers translation and interpretation. *In general, any required fees will be charged through our partners as listed above. Stay at one of the nearby hotels if you are coming to the hospital for outpatient care from far away. You can stay at our partner hotel for a reduced rate. Q1 What types of cancer is this treatment for? Not all types of cancer can be treated with proton beam therapy. Currently, it is thought that proton beam therapy is best for primary cancers in the head and neck, lungs,　esophagus, liver, pancreas, prostate, and bladder, in addition to locally reoccurring cancer after surgery and monostotic metastatic tumors (hepatic metastasis, lung metastasis, lymph node metastasis, etc.). There are 3 main types of cancer treatment: surgical resection, chemotherapy, and radiation therapy. (Proton beam therapy is a type of radiation therapy.) Based on the characteristics of the disease and the disease’s progress, one or a combination of two or more therapies can be chosen for treatment. Multiple treatments can be performed at our hospital, together with the Chemotherapy Center and surgical resection. Q2 Can treatment be done even if the cancer has spread? A2 If the cancer has spread to only one organ or region, radiation may still be effective, but if the cancer has spread to multiple areas, proton beam therapy may not be effective as it is a localized treatment, and full body treatment should be prioritized over localized therapy. Q3 Is the treatment effective against leukemia and other blood cancers? A3 This treatment is not suitable for leukemia and other cancers that have spread throughout the body. Q4 How long does one treatment session last? How long does the entire treatment process take? A treatment session will last between 15 and 30 minutes, including positioning, with 1 to 3 minutes of that time for radiation. The entire process requires between one month and one and half months in general. You do not need to be hospitalized, as proton beam therapy does not affect the entire body. However, you may be hospitalized based on treatment, distance from the hospital, or physical condition. Q6 Are there any side effects, like pain during treatment or loss of hair? There is no pain while the proton beam is being used. Hair loss will occur at the sight where the proton beam is positioned, but you won't experience hair loss anywhere else. Some side effects may appear depending on your treatment, so please ask the doctor during your proton beam therapy consultation. Q7 Is there an age restriction for undertaking this treatment? Anyone over the age of 2 years may undergo treatment. Q8 What is "advanced medical care"? Advanced medical care has been rated as care to be clinically evaluated before being included in general treatments covered by health insurance. It can be performed alongside treatments covered by health insurance at medical institutions that have met criteria set up by the Minister for Health, Labour, and Welfare. This is why the patient has to pay all fees associated with advanced medical care. Some advanced medical care becomes eligible for insurance and some advanced medical care is deemed inappropriate for insurance for a variety of reasons and no longer is classified as advanced medical care (loss of approval). Q9 Who is eligible for advanced medical care? Certain requirements must be met to be eligible for advanced medical care. Please check with your doctor first to see if you are eligible.